There are many ways I like to wrap my Christmas presents and I put great care into them all. I wrap presents differently for adults and children, as adults see their presents for longer whilst children only tend to see them on Christmas morning and they tend to be more excited about what is inside! For children’s presents I use a child wrapping paper, for example this year I have Frozen, Disney Princess and penguin paper. I’ll wrap the present up in the paper and then add a home made tag and a bow. 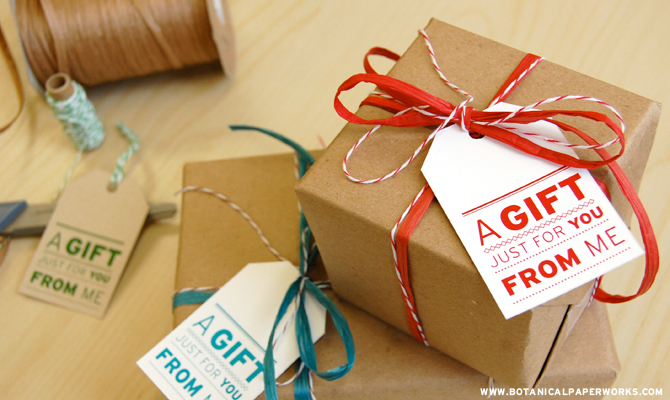 I like the look of wrapping presents in brown paper, with coloured ribbon, bows and tags. It is a cheaper option and it looks more home made and old fashioned too! At Paperchase they have bauble present toppers which I think would look perfect with that type of wrapping. It also looks extra cute to wrap string around the ribbon for a more rustic look! Because I tend to buy people more than one present, another favourite idea of mine is when you’ve bought someone quite a few presents, to wrap them all up separately and tie them all together with ribbon so it looks like a little few parcels! Another idea if you have quite a few presents to give someone is putting them in a gift box with shredded tissue paper, it makes it look like you’ve gone to loads of effort for their present and people appreciate that! How do you like to wrap your gifts?